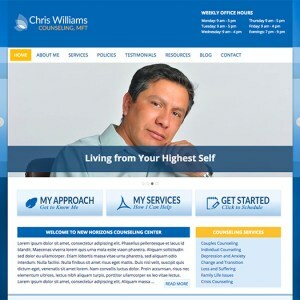 A calming, tranquil theme built with blues and whites and an inspiring splash of yellow, this new premium WordPress counseling theme offers the best in design appeal, user-friendliness, and ease of customizability. Your therapy clients, as well as new visitors to your website, will be greeted with a professional, inspiring front end design, while you’ll be able to manage it all through an intuitive, flexible Genesis framework-built WordPress admin interface. Concerned it’ll take too long to build your site? Fear not! With this theme, as well as all of our premium Genesis WP themes, we offer the full live demo install file. That means your personal therapist website will be up and running quickly and seamlessly. And being a fully responsive theme, your clients and site guests will be able to access your site via any web-ready device - whether desktop, tablet, or mobile phone.